Xerox VersaLink C600 was launched as a replacement for the Phaser 6700 series as the fastest desktop colour printer from Xerox. The new VersaLink C600 is another complete redesign from the ground up with some mixed results. This new engine is much smaller and lighter than the previous engine which is generally a plus but a major upgrade is an overall increase in throughput. 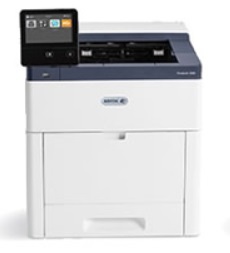 Xerox combines a new, smaller, faster desktop colour machine with a fast 1.05 GHz processor, fast Ethernet, and 2GB of RAM to maximize performance. Rated to 55PPM and 45PPM for colour or monochrome respectively, the VersaLink C600 does very well in all speed tests. Set up is easy to do after the printer is unpacked. The four standard toner cartridges that are included are mounted on the front of the printer. Installing Xerox C600 on the network also appears fast when Xerox printer installation software works perfectly. Download the Xerox VersaLink C600 driver according to the Operating System on your PC or laptop at the link below.